Once upon a time, there lived a Product Manager. He handled product strategy for this startup — an online food delivery service. They had received fresh funding and were growing exponentially. But so was the overall industry in India. It included a few big players, and a lot of emerging big and hyper-local startups. In an increasingly competitive environment, he needed to bring out features and value-additions that were very relevant to the users. He called in his core product team, as well as marketing and sales teams. After many brainstorming sessions and late nights, they still did not come up with the idea. Product teams gave many solutions of optimising the app and managing the delivery back-end efficiently. Marketing team suggested newer tactics of customer retention and ways of reducing their CAC — customer acquisition cost. Sales teams gave deep insights into why some of the payment methods were favoured over others and how they could make the transaction process smoother for their users. These were all good ideas, but not necessarily the ones he was looking for. He started thinking about the one irresistible thing he can offer his users? This time, he called in his design and UI/UX teams — along with product, marketing and sales teams. Now they brainstormed again. This time, not from inwards. But from outwards. Everybody in the room became users, not developers of the product. They came up with many tactics and features of value. To reduce bias, he conducted many user-tests and fine-tuned some of the features discussed. At the end of the exercise, the product manager had a set of features, that was never available in the market, that solved for a very valid and persistent problem among their largest share of users. It offered convenience that the users never thought they’ll get. The product manager, most importantly, didn’t waste time in building the wrong things for the right users. Putting users at the start of product development, and thorough user-testing enabled a larger chance of success in a competitive environment. This allowed him to scale and manage the back-end effectively, without worrying about failure. Close collaboration between dev, product, design, ux and marketing teams ensured that the updates were as polished as possible, giving the users almost bug-free experience. His CAC started to come down, frequency of customers increased and eventually, the company started to see an increase in market-share. And ofcourse, revenue. Brands and companies that focus on their users, automatically invest in UX. When you are building something that others are going to ‘use,’ you need to know how, why, when, where and all aspects of it. A great example of this has been Amazon, which goes deep into understanding its users’ experience at each stage of their journey. Design led companies grow faster than companies who haven’t adopted design or done it incorrectly. 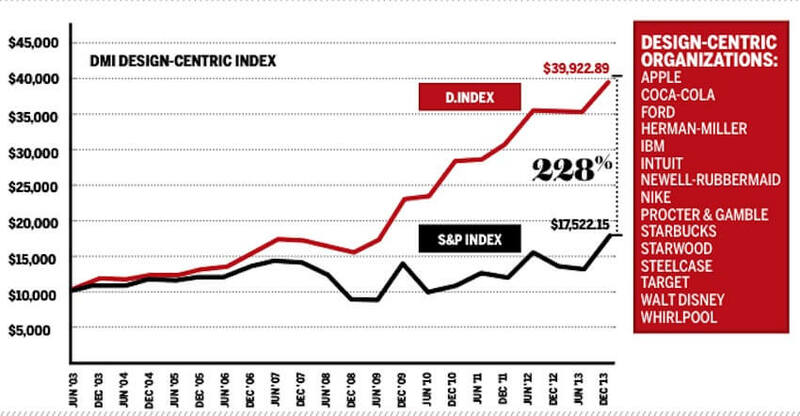 In fact, over 5 years ago, DMI (Design Management Institute) discovered that Design-driven companies outperformed the S&P index by 228%. It sure wasn’t by chance. Am guessing their ROI was high as well! Can you guess the consumer app referenced in the story? Is there one? Let me know what you think of ROI and Design in the comments. This article was first published on LinkedIn by Siddharth Kabra, CEO, Monsoonfish. Dear John, I’d put it slightly differently. Design matters, but equally. 5 Ways to Scale a Great Application!